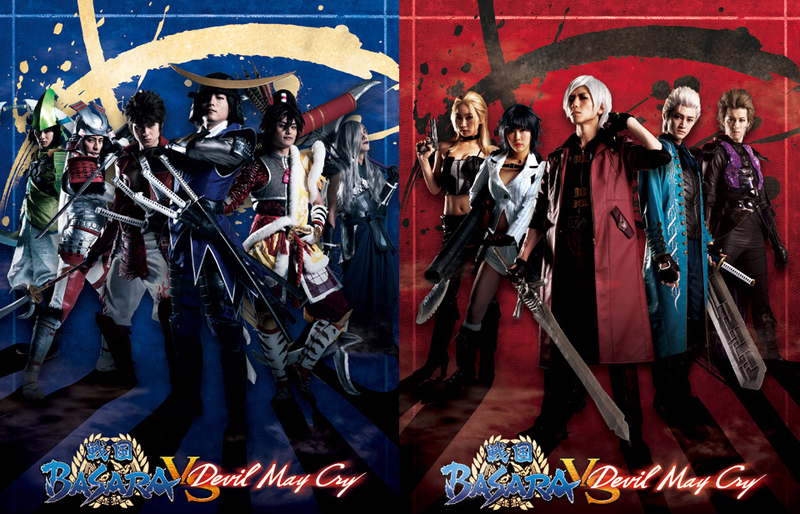 The Butai Sengoku Basara vs Devil May Cry stage play is going to start its run just over a week from now, so the official site has been posting a large number of updates recently to get fans in the mood for some time-travelling, demon-fighting action. Shots of the cast in costume have been added along with short video messages from each actor introducing themselves. 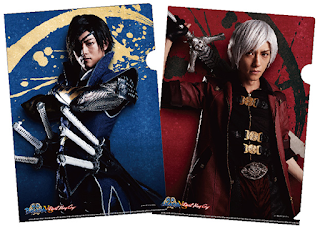 It's strange seeing Yoshida Tomokazu, the actor who played Kojuurou for years in Butai Sengoku Basara, elaborately dressed up as the 'black knight' (previously billed as Prototype Nelo Angelo). I'm curious about how this stage play is going to turn out. 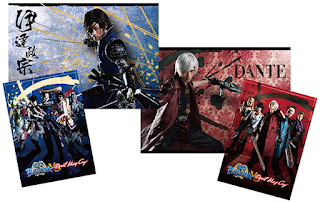 Of course, fans lucky enough to visit the theatre will be able to commemorate this strange crossover with a wide range of special merchandise as usual. 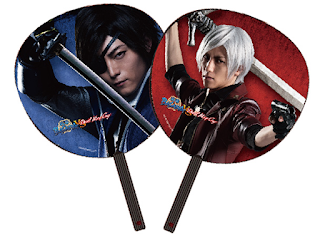 I know I must have been writing about Sengoku Basara news for a while as this is the third year in a row that I've reported that the series will be teaming up with the Akai Hane Kyoudou Bokin ('Red Feather Community Chest') national charity drive. Brand new Sengoku Basara 4 Sumeragi posters will be used to promote the campaign across 29 prefectures and (hopefully) raise awareness of the need to donate starting from October 2015. 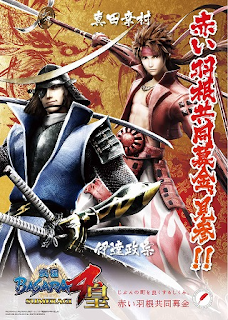 This year, Yukimura is joining Masamune on the main poster artwork for the first time. The Pasela chain has updated its website to show off the special Sengoku Basara food and drink available at its various entertainment locations. There's the Capcom Bar's new limited edition Sengoku Basara 4 Sumeragi menu, as well as the Pasela karaoke menu and the food/drink menus from its two themed cafes. 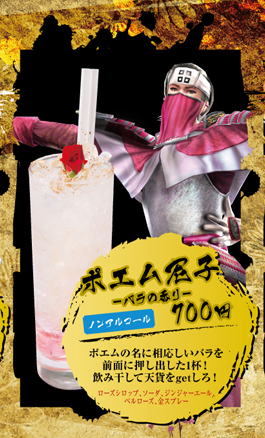 Some of the drink designs are incredible, like the Tadakatsu cocoa, the scary-looking Hisahide drink with hot peppers and the probably-difficult-to-drink Kanbee cocktail complete with iron ball. 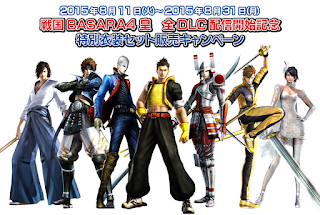 A new campaign has been launched, during which all seven of the 'former DLC' costumes originally for Sengoku Basara 4 will be available in a ¥1,500 set for PS3 Sengoku Basara 4 Sumeragi owners. 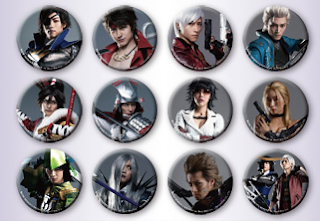 The offer will run from today until 31st August 2015, so if you happen to meet the requirements and don't already have those costumes it's probably a good idea to hurry to the PlayStation store. 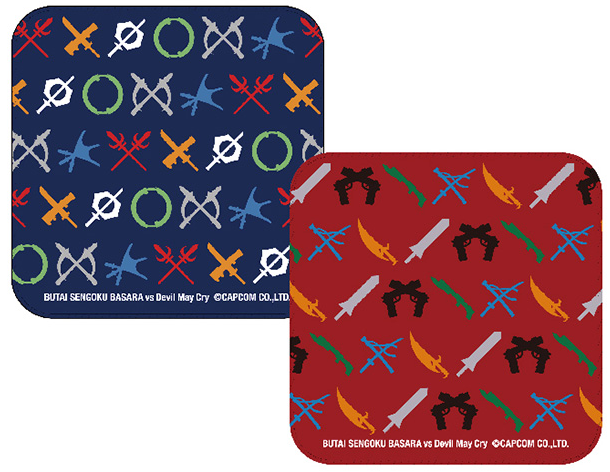 They're usually only available individually for Sengoku Basara 4 Sumeragi. The costumes included in the bundle are those shown above: Date Masamune (hakama/wooden sword version), Sanada Yukimura (azure dragon version), Ishida Mitsunari (DMC Vergil version), Tokugawa Ieyasu (Gakuen Basara version), Shibata Katsuie (absolute justice version), Shima Sakon (twin sword kung fu version) and Ii Naotora (wedding version). I know a few fans have been waiting for this. 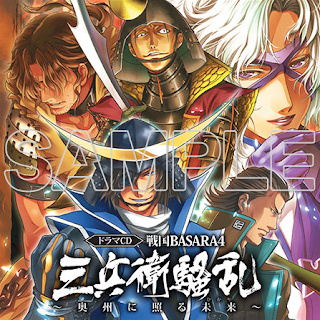 A Manga Oh listing has appeared this week to confirm that Yoshihara Motoki's Sengoku Basara: Bontenmaru-hen manga from Sengoku Basara Magazine is soon going to be available as a standalone book. 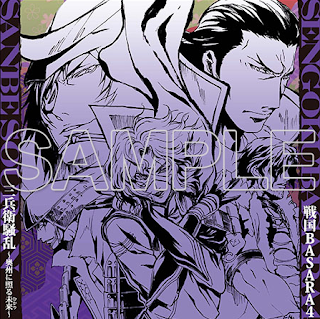 The price has yet to be confirmed but the manga will be published under the Dengeki Comics NEXT line on 26th September 2015. If you're one of the fans who have been wanting to read the story without buying all of the individual magazines, this will be a great chance to catch up and read the story of Masamune's past. I expect that the book will collect the entire story since it doesn't have a volume number. 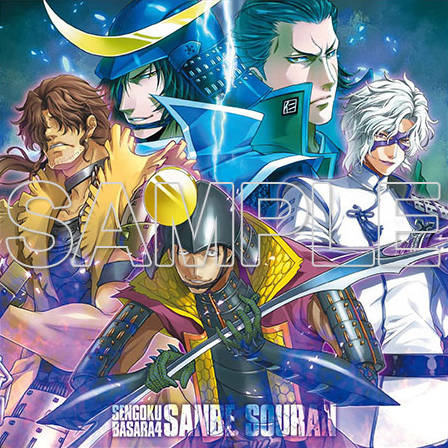 The final cover art for the Sengoku Basara 4: Sanbee Souran ~Oushuu Ni Teru Hikari~ ('Three '-bee' Mayhem ~The Future Which Shines On Oushuu~ drama CD has now been posted on the Dengekiya shop. There are also previews for the bonus illustrations which come with the first press edition. Yokota Mamoru's artwork looks amazing. I'm looking forward to listening to this CD! Friday's new video was one we have already seen before, but now it's possible to watch (Approximately) 10-second Theatre: Flame Shingen, Ice Kenshin at any time as a standalone clip. Monday's was (Approximately) 10-second Theatre: Let's Have Tea. Information wanted: Does your copy of Sengoku Basara 4 Sumeragi have muffled audio? 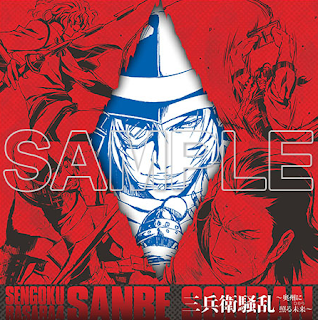 A couple of people have sent me messages about their copies of Sengoku Basara 4 Sumeragi having some kind of issue with muffled sounds. I haven't experienced this at all myself and I haven't heard any Japanese fans talking about it, but I'd like to help if I can. Out of curiosity, have any other readers experienced audio problems with the game? If you can confirm the symptoms, version (PS3/PS4, disc or download) and any other information you have, I'll try to investigate this further when I have some time. Come to think of it, some (not all though) of the voices in my game have a sort of... graininess to them? It's primarily the voices that are part of attack animations and such, so notably Kanetsugu and Musashi sound kind of weird. However I can't recall which other characters, are effected by this, but I do recall another character or two sounding off. I thought this was, however, intentional or that they were just using old soundclips, but if even the actual playable characters have it that can't be the case, right? I will say I've not tried it on my Japanese account save to activate my costume DLCs, only my US account. I don't think that's the issue if Japanese fans have reported anything regarding sound issues... but I think it's worth noting, especially remembering that apparently Maria scolded Western users for playing the game early when in Japan it was officially out. Thank you very much for the feedback, I'm compiling a list of all of the reports and it does seem to be a widespread PS3-only issue! ... wait a sec... that sundae I retweeted a few days ago that I thought the person was jokingly calling a KenKasu sundae wAS AN ACTUAL KENKASU SUNDAE? The similar situation with muffled sounds. I call it just "similar" 'cause I really don't know what other people do mean when say "muffled audio". I only have noticed some differences between sounds in my versions of original SB4 and SB4 Sumeragi. 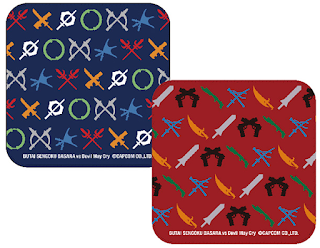 - the muffled (if compared to original) sounds in Sumeragi are: "perform Giga Basara" sound, "pick up an item" sound, "hit an enemy" sound, "parry" sound. About "parry" - in original SB4 there was no difference between sound of normal parry and sounds of some special actions such as striking down one of Tenkai's skulls or Tsuru's arrow aura or when you block an attack with Kingo's ability. Now in Sumeragi sound of normal parry is muffled, but sounds of special actions are not, in other words now the sounds differ (and this is kind of positive). I'm not sure if it's useful but anyway. And the last one: after 2 weeks of playing I've almost got accustomed to these new muffled sounds. Thank you as well, I will add the descriptions to my notes. The detailed descriptions are very helpful! What the difference of +2 hits count and 2x attack power? If you just want to kill fast, attack power is king, but +hit is an important stat if you want to build massive combos.